You are here: Home / Our Animals / Chickens / We tried an Eglu Cube Chicken Coop & Here’s What Happened. This article is sponsored by Omlet. In exchange for an Eglu Cube and run, we agreed to review the coop. However, this review is our objective opinion and honest thoughts about our experience with the Eglu Cube. What’s the Eglu Cube look like? We tested the Eglu Cube with 5 young chickens – 3 pullets and 2 young roosters. We had been eyeing it for a while, and thought it would be perfect for our latest crop of Brahmas, Speckled Sussex, and Jersey Giant chickens. We’re very excited about this coop – it’s beautifully designed for any backyard farm, and we were thrilled to give it a test run and review it. During the 2 weeks we tested it before writing this review, our flock was very happy – every day they got fresh grass (aka new bugs to eat!) and happily spent a few hours every morning eating nutritious greens in addition to their grower feed. The first night, they didn’t understand they could go up the ladder and spend the night in the coop area – we had to put them inside it. However, the second night, they surprised us – they went into it themselves. So, clearly they felt happy and secure in it. (If you want to buy the Eglu Cube, go here and use the coupon code FRUGALCHICKEN – you’ll save $90 on this exact set up). Why you need the Eglu Cube in your life right now. The coop arrives in the mail in several boxes – it was easy to put together though. No special tools were needed, and the manual was easy to follow. Our chickens were able to go inside their new home in just a couple hours! The Eglu Cube has several features that make it a great choice for your flock. The design is attractive – it will fit easily into any backyard and your neighbors will love how it looks. It’s also important to note that this is a tractor, and not a permanent structure – this is an important distinction since many areas have laws about building structures in your backyard. You might be able to slide around those laws with the Eglu Cube. The entire coop is secure – predators will have a hard time getting into the run, and as long as the doors are all closed, they don’t stand a chance against the safety features. To open the main coop door, you have to pull up on the knob and twist. The backdoor and the door to the nesting box are also twist and pull – no predator will be able to figure it out. The run has wire safety features that make it difficult for digging predators, such as dogs, to dig under the coop to get at your chickens. It’s also hard to knock over (we did test it! ), so a dog can’t just pounce on it to get at your birds. The coop also comes with wheel attachments, and it’s easy to push the tractor to move it to a different area of your yard. 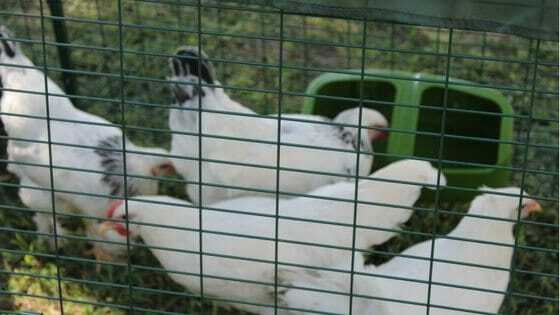 The advantage, besides getting green grass, is your chickens aren’t living on their own feces – this could potentially reduce illness because their not reinfecting themselves with bacteria or inhaling their urine. The coop is also easy to clean. It’s made of durable plastic, so we were able to just wipe it down with all-natural cleaners. There’s also a drop tray to collect manure, so your chickens aren’t sitting on their own poop. It also makes composting their manure very easy. There’s nothing really bad about this coop – I truly love it and think it would make a good home for your chickens. There ARE some things to think about though. The run is well constructed and will keep your chickens safe from predators, but the top will have to be covered in the rain, snow, and sleet and in heavy winds to keep your hens out of the elements. In the daytime, they’re unlikely to go into the coop themselves. However, because the Eglu Cube can be rolled, you can bring it under a barn or other structure. Another option is to tarp the run in really bad weather and then remove it when the weather is better. Another consideration are the locks for the double doors. The doors are secure – it’ll be hard for predators like raccoons to open it. But if you have small children or other curious parties (like nosey neighbors), you’ll want to consider adding an extra clasp as a double lock entry. Our 3 year old daughter learned quickly how to open the doors, and let our small flock run free several times! Finally, we realized that we will have to modify one of the doors in the summer with a screened area – because our summers are so hot and humid (it can be well into the 90s with high humidity at night), the coop area will be too hot for them in peak summer. However, this is an easy adjustment, and doesn’t diminish the quality of the coop – any coop we used would need SOME sort of customization. The Eglu Cube is a great investment, and perfect for your small flock. 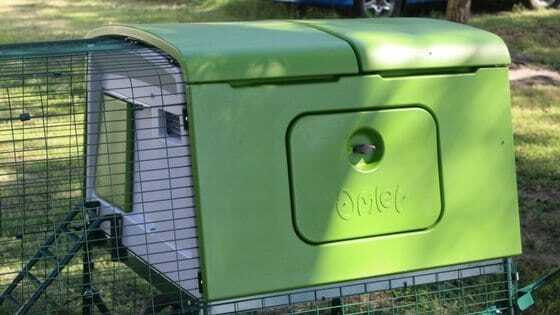 We love it, and will not hesitate to buy another one for our chickens!